Professors of Astronomy Gerald Hawkins and Fred Hoyle both concluded that the 56 holes at Stonehenge’s Aubrey Circle could be used to predict eclipses. 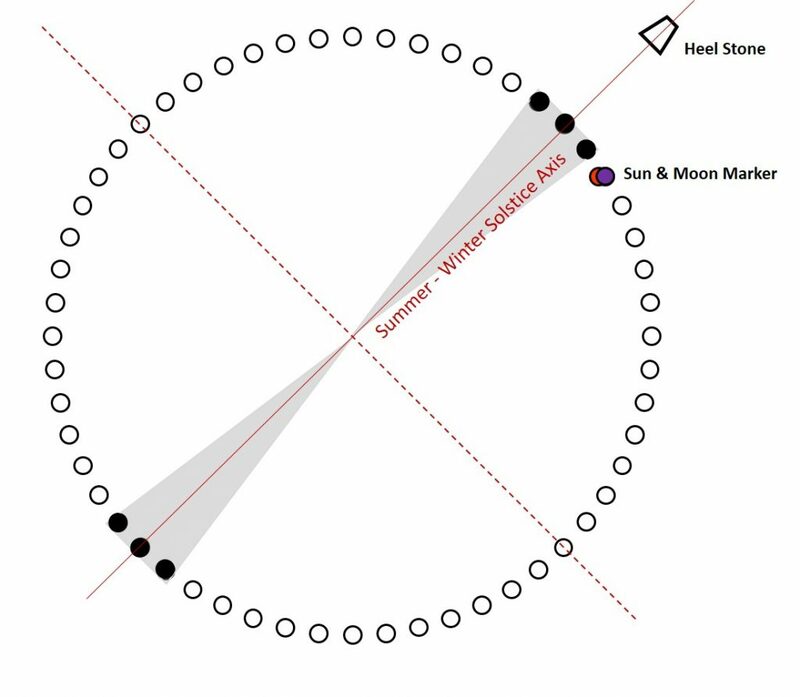 How the Aubrey Circle posts and the node, sun and moon markers predict eclipses, as discovered by Hawkins and Hoyle, will be set out in this article. The astronomical event on the Summer Solstice of 2020 will also be explored. The Aubrey Circle will, on that day, reveal a space – time event expressing the harmonic number patterns and geometry inherent in Stonehenge and the Universe. During this one-off event, the interrelationship of the Sun, Moon and Earth with the Milky Way’s Galactic Equator will be eloquently expressed. 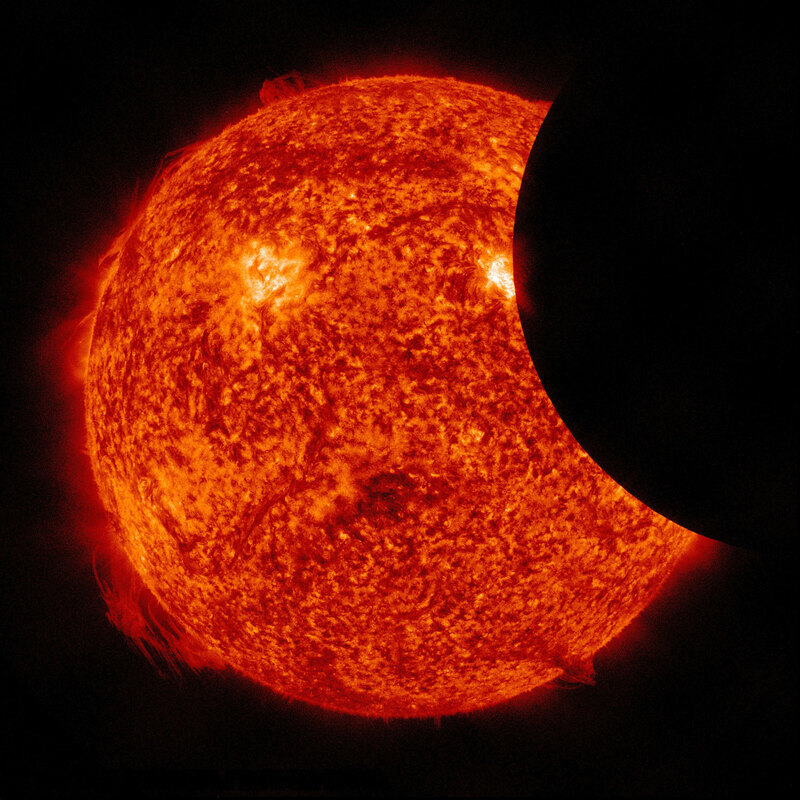 There will also be an annular eclipse of the Sun, on this solstice, which in itself is not unusual, but the position of the Sun on the Galactic Equator will be. The astronomical phenomenon of the Sun sitting on the Galactic Equator on a solstice may sound familiar, for indeed it is. The ancient Mayans had predicted this type of event. 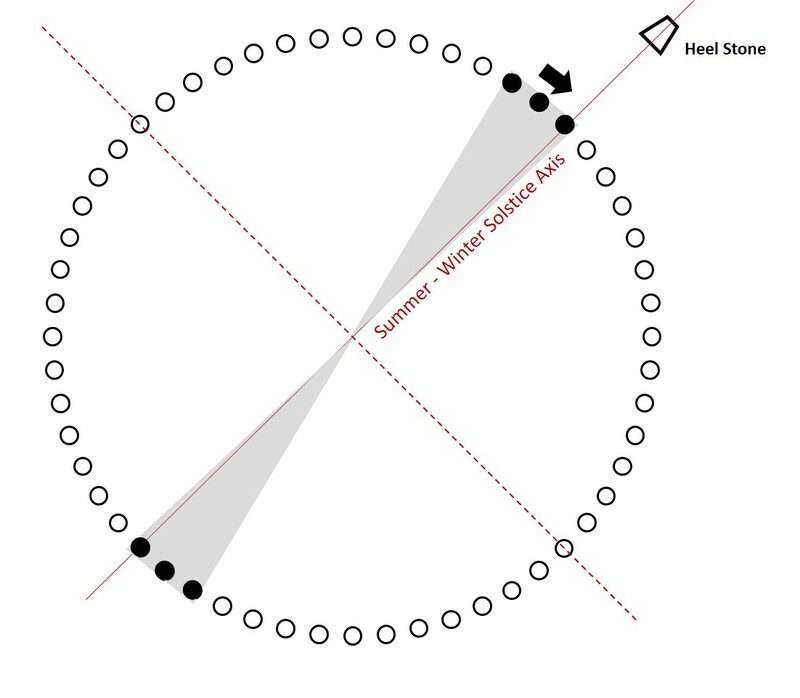 They used the Sun sitting on the Galactic Equator at the Winter Solstice of 2012 as the datum of the end of a cycle, their Long Count Calendar. It is well known that the ancient ones, including the Mayans, tracked the precession of the equinoxes and used this knowledge to record the time it took for the cycle of precession to complete a full circuit of 25,920 years. The standard scientific explanation is that precession is due to the Earth’s very slow wobble, similar to a spinning top that wobbles. 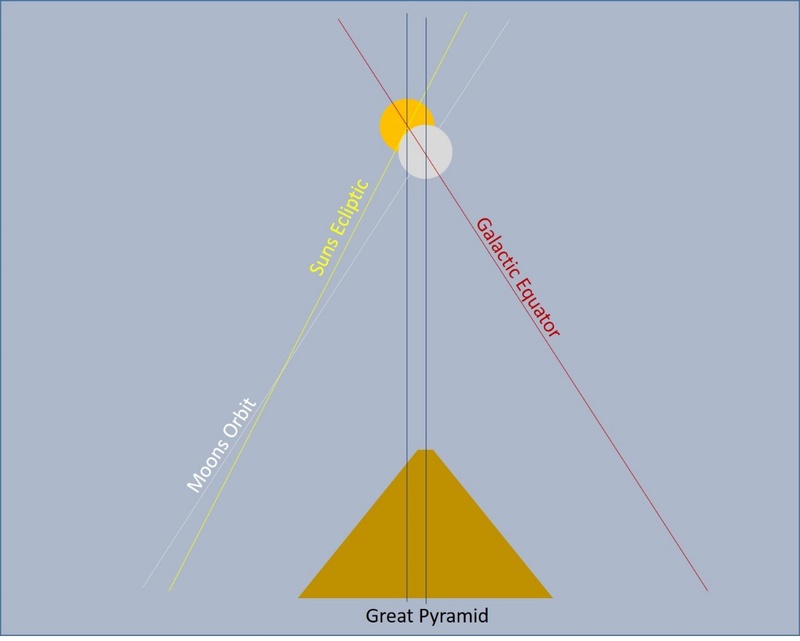 What is most intriguing about the 2020 Summer Solstice event compared to the one in 2012, is that there will be an annular eclipse of the Sun on that day that will not only be predicted in the Aubrey Circle’s design, but also the Great Pyramid at Giza’s. These are both well-known ancient astronomical monuments that were built using the same geometric ratios based on the prime numbers 3, 7 and 11. This number association will also prove to be significant. This is set out in more detail in this YouTube video and should be viewed before continuing this article. 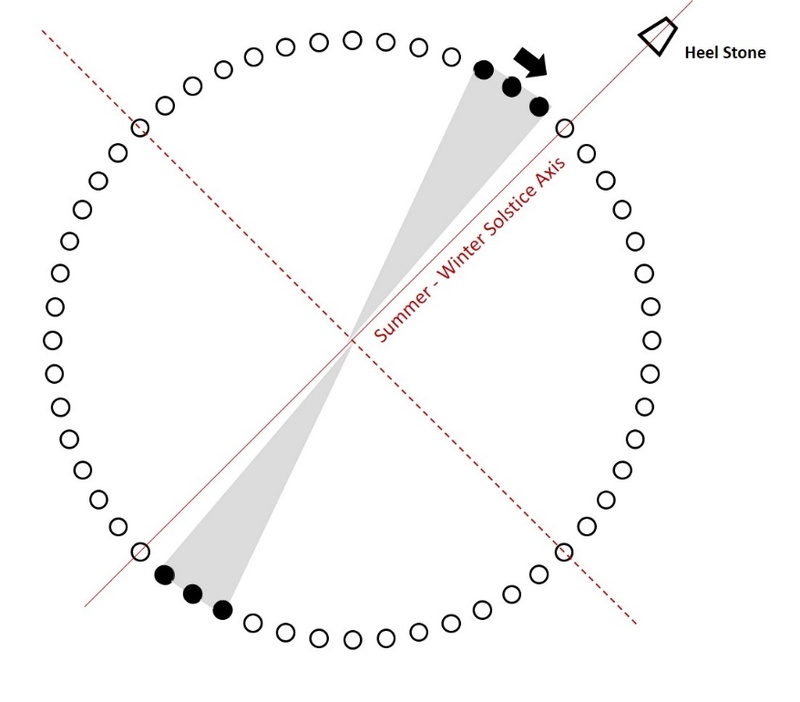 Now we can explore how the Aubrey Circle’s astronomical model, as discovered by Hawkins and Hoyle, works and how it will play out on 21st June 2020. The points where the paths of the Sun and Moon appear to cross (the “nodes”) gradually move around the sky, taking 18.61 years to make one revolution. This period is called “the regression of the lunar nodes” (see diagram below) and occurs because the Moon’s orbital ellipse rotates slowly around the Earth. This can be tracked at the Aubrey Circle by a clockwise movement of two sets of three markers, moving 3 positions every year around the 56 position holes. These markers are shown in black in the diagram below. 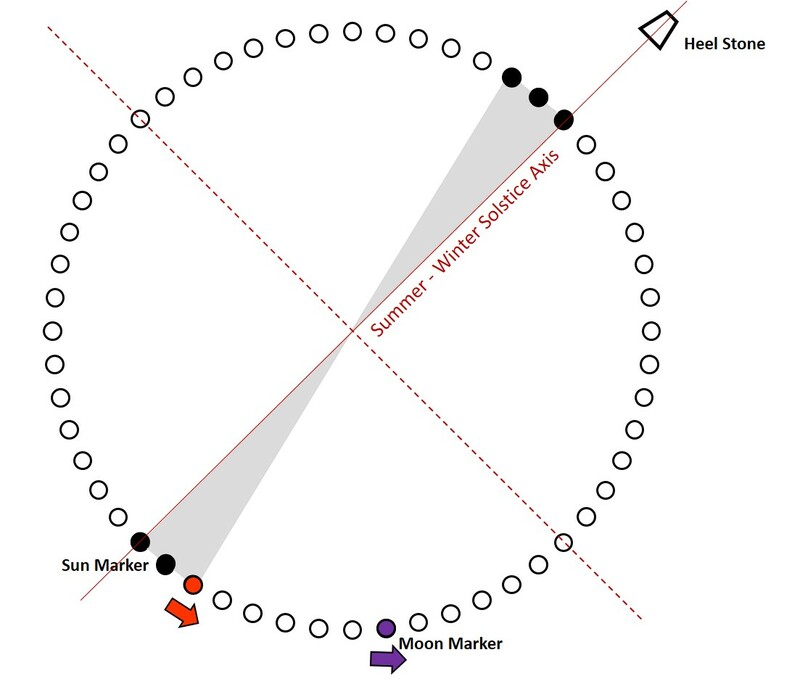 At the end of 2019, the middle of the 3 node markers will be two positons away from the solstice axis running through Stonehenge. 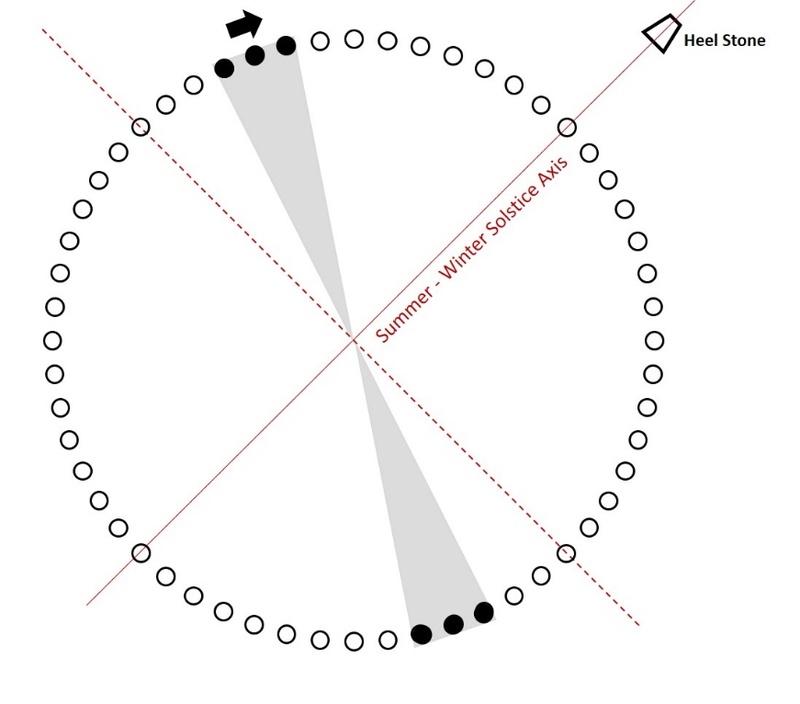 On the Winter Solstice of 2019, the two sets of three node markers will move clockwise one place to the position indicated in the diagram below. The Moon completes one revolution of the Earth every 27.3 days (the “sidereal month”). The moon marker is moved anticlockwise two Aubrey Holes per day. Therefore, the moon marker goes once round the circle in 28 days; 28 x 13 = 364. The Moon, when directly opposite the Sun on the first full moon after the annual Winter Solstice, enables a full circuit of 365 days to be completed. The Sun moves through the entire sky once in about 365.25 days (the “tropical year”), so the sun marker is moved two holes anticlockwise every 13 days. The sun marker goes around the circle in 364 days. The marker is moved one further position on the Winter Solstice every 3 years, and 2 positions every 4th year, keeping the whole system of Sun and Moon movements in sync with the 365.24 years. When the Sun sits on one of the node markers there is an eclipse that day. 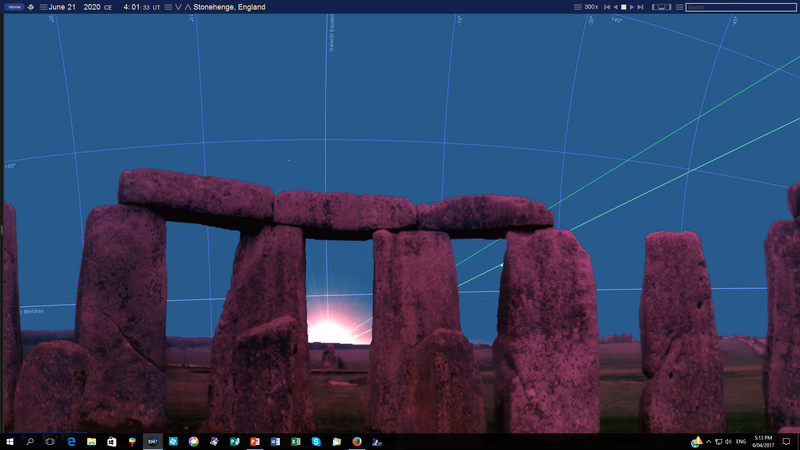 The eclipses are not always visible at Stonehenge. This leads to an interesting question: Why build the system to predict an event that does not occur at that location? 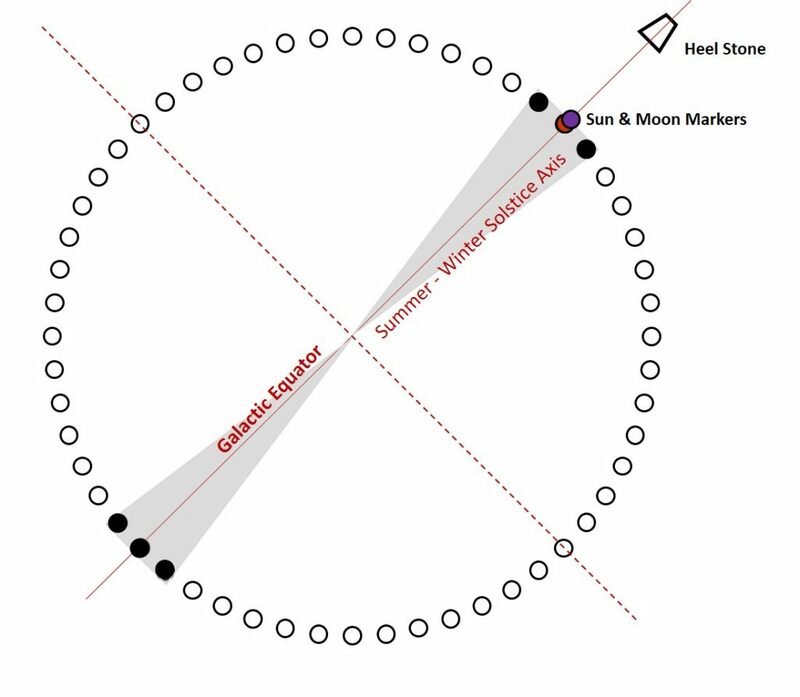 The diagram below shows the marker positions for the nodes, moon, and sun markers for an eclipse on 26 December 2019. 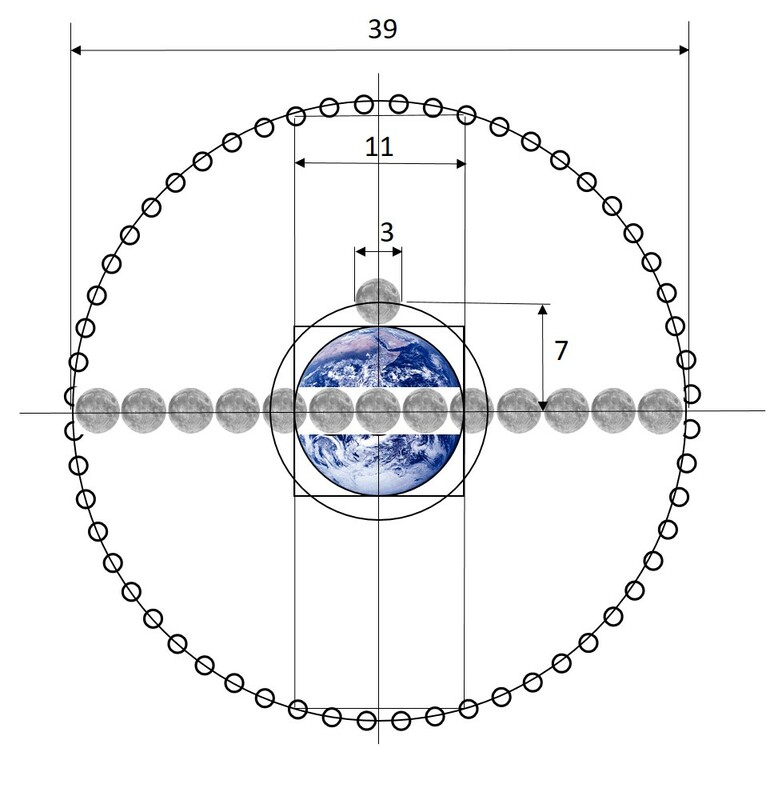 During May on the full moon, the two sets of three node markers are moved clockwise to the positions shown in the diagram below, to keep their movement to 3 positions per year. 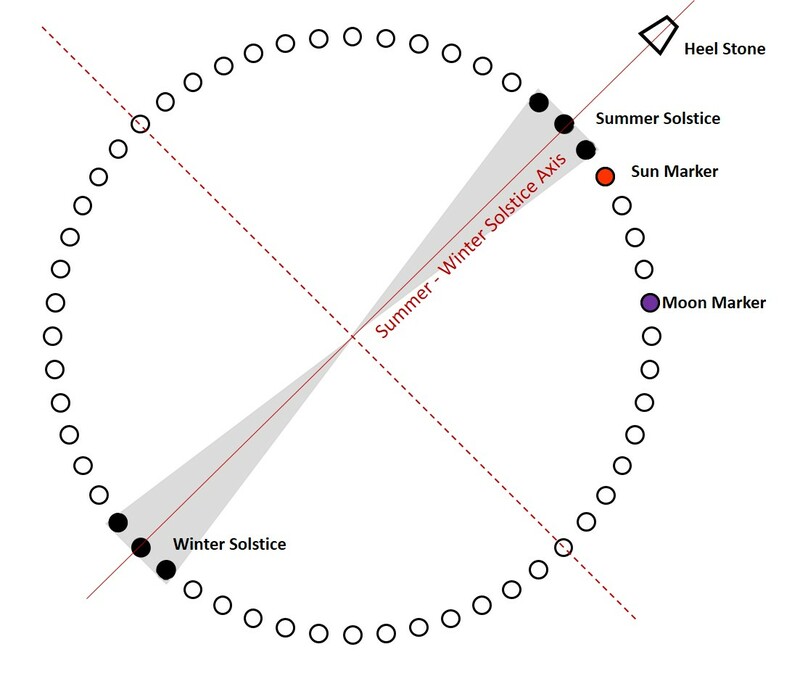 Note that in 2020, the two central node markers will be aligned with the summer- winter solstice axis. 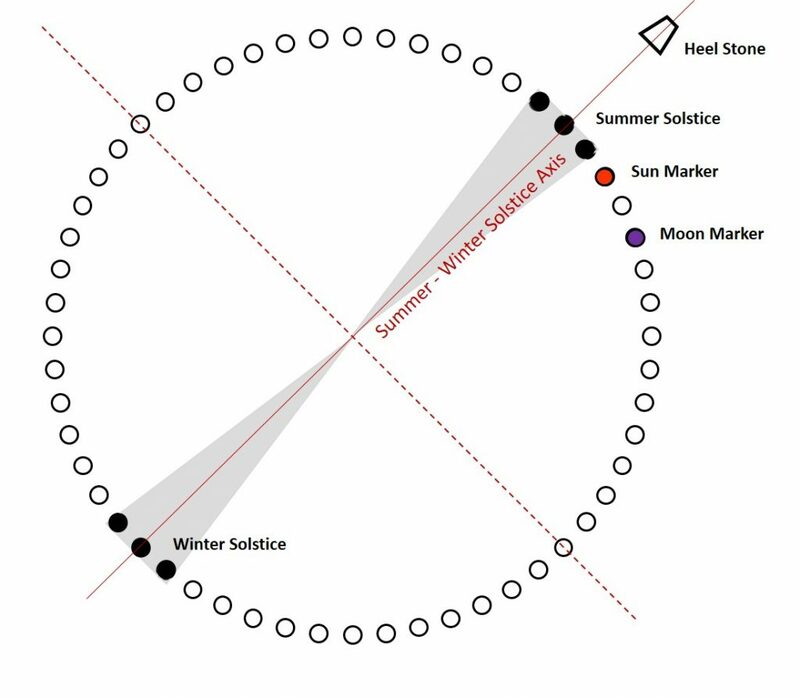 On the Summer Solstice, just before dawn, the sun and moon markers will move together two positions onto the central node post. These will all align with the Galactic Equator, which will also have lined up with the solstice axis on the heel stone at dawn. Since the sun and moon markers will be in the same position, and on the same node marker, it will herald an immediate eclipse for that day. This will already be underway in central Africa on 21 June 2020. So what is the relationship between the Aubrey Circle and the other two main circular structures at Stonehenge? To appreciate their relationship, we must understand that the two inner circles at Stonehenge are based on the ratio numbers 3 and 11 and that these ratio numbers, when multiplied by 720, provide the diameters in miles of the Earth and Moon. The Earth’s ratio number is 11 x 720 = 7290 miles. The Moon’s is 3 x 720 = 2160. So the diameter, as a ratio number of Aubrey Circle, has the same number as the circuits the Moon makes in one year; 56 (number of holes) x 13 = 364 days. The average diameter of the Aubrey Circle is 280.8 feet, which is 100th of the diameter 28,080. The Earth’s ratio diameter is also directly related to the Aubrey circle by being the chord ratio length by counting across the centres of 5 of its post holes, which equals 11 (this is also shown in the diagram above). 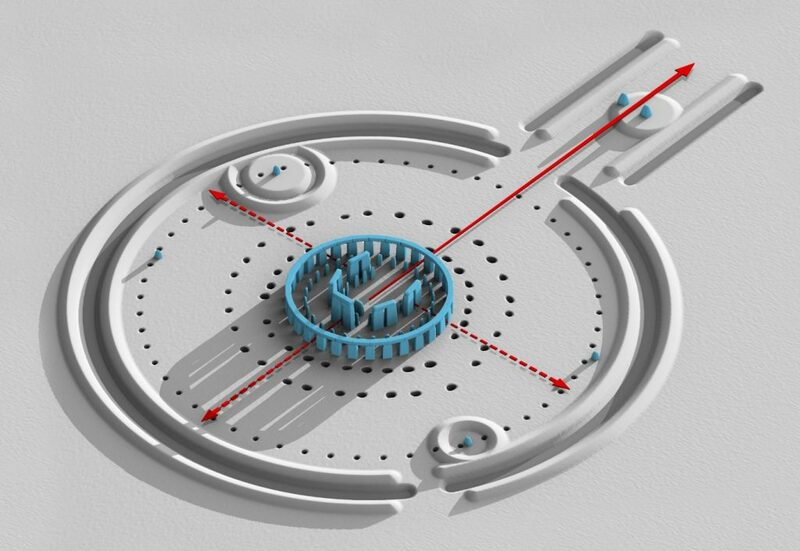 Once the Earth’s diameter was established within Stonehenge’s inner structure, the other three phases of its construction, including the positions and diameters of all the other circular structures, were easily established with simple geometry and mathematics, as shown in this YouTube video. This is the same geometry that will be replicated in the skies over the locations where the eclipse occurs. It is also noted that the sum of six consecutive primes 3 + 5 + 7 + 11 + 13 + 17 adds to 56 which also include the numbers 3, 7 and 11. Interestingly, 39 shares the exact same prime numbers as 56 i.e. 3 + 5 + 7 + 11 + 13 = 39. The Great Pyramid also has the same 7 to 11 ratio built into its structure. The height of the pyramid is, for example, in a 7 to 11 ratio with its base: 481 feet to 756 feet. 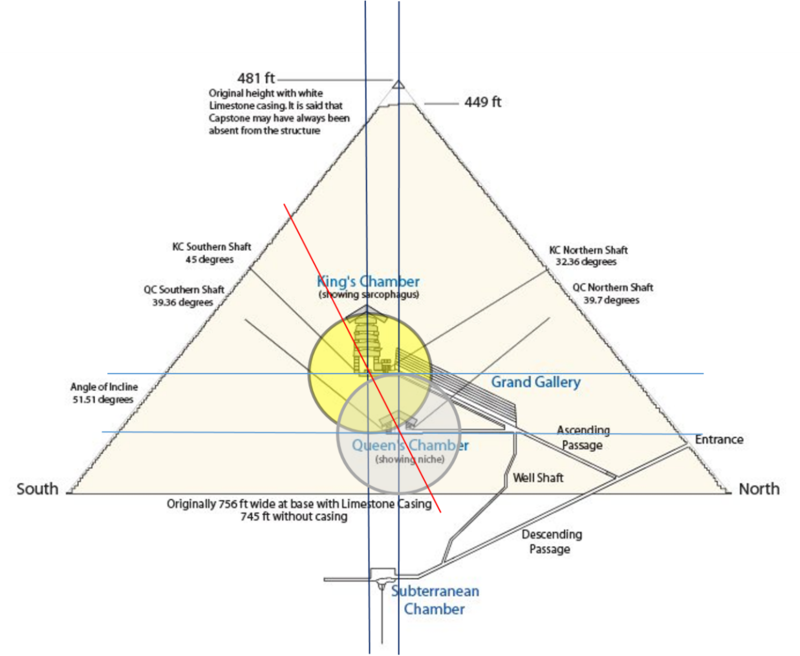 will form the Vesica Piscis along a common axis running from the centre line within the King’s Chamber floor down to the centre line of the Queen’s Chamber (see the red line below). This line will be parallel with the Galactic Equator, as seen above the Great Pyramid at that exact moment in time. The geometry of these two major structures will be replicated astronomically, in exact proportion, at a precise time in the sky. What should we make of this? Are these alignments just an amazing series of coincidences? To answer this question, we need to shift our focus to yet another culture from our ancient past which also had a fascination with the numbers 3, 7, 11 and 56. In the ancient Chinese book the I Ching (which is over 3000 years’ old and based on a more ancient source of over 5,000 years’ old), there is not only another interplay of the above numbers, but also an insight into what this association of numbers means. This insight forecasts the outcome of the Summer Solstice event of 2020. To explore this numerical relationship further, click here and go to the section, ‘I Ching Meets Stonehenge’. Due to the significant changes taking place on our planet, a further website called The Unified Theory of Everything has been created. This website provides an overview of the true nature of the cosmos. Modern, scientific cosmology is artificially limited. It tries to exclude the human viewpoint, has no concern for human psychology, and fails to acknowledge the powerful influence that cosmology – the way the universe is describes – exerts upon minds of people exposed to it. Not just individuals but whole societies, nations and cultures are conditioned by the prevailing view of the world. There is no such thing as an objective, value free cosmology. It is, according to John Michell, imperative that we know what the cosmos truly is so we can live effective and meaningful lives within it.